Mianus River Park is a small parcel of land on the Mianus River. The park straddles the border of Greenwich and Stamford CT. Heavily used by riders from all over the metro area (Connecticut, New York and New Jersey), this park requires thoughtful riding and watching out for hikers and the rare equestrian. You can\'t get lost here, though the trail network is a spiderweb. Some technical sections and short, steep power climbs keep it interesting for the racers, while lots of dirt roads and flat terrain make it an ideal spot for novices as well. Review: Nice place to ride if you want an easy, flowy ride. Good for recovery day or testing a new component/gear. It really is a pretty place to ride, especially Ridge Trail. Parking on the Stamford side is a mess on the weekends. Review: I don't usually come up to Mianus River Park, however when I do I always a lot of fun. 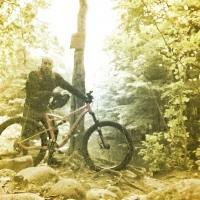 I am used to riding Sprain Ridge, as it is a more convenient trail for me, and Mianus is totally different. Compared to Sprain Ridge, I would say this trail is similar in style, but the routes that I have ridden here aren't as tricky as Sprain Ridge. As for scenery, in the fall these trails offer some amazing contrast of autumn colors, but some of the trails can become slippery and hard to see with all of the leaves. Overall, these trails are good for beginners, but I don't think an experienced rider would have as much fun on them as a novice of beginner MTB. Don't get me wrong though, an intermediate rider can still enjoy these trails very much. Review: I live close to this park, so I'm there a lot. I love it and never get sick of it. There aren't as many insane climbs as there are in other nearby trails, but the variety more than makes up for it. Flowy sections, roots everywhere, rock gardens, obstacles, jumps. The key to having a blast on these trails is to hit all the off-shoots. If you stay on the main loops, it won't be as good. Hit Swingset, Cave, & Ridge Run. Trails are very well-kept and well-labeled. Very difficult to get lost there since the Mianus river runs all along the east side and links directly w/ the Stamford-side parking lot. ** Can get crowded if you go in the afternoon on a weekend - Lots of dog-walkers. Review: There are a lot of different types of trails here. Everything from wide smooth stuff to technical single track. I learned to ride here years ago and recommend this park for that purpose because there is a lot of variety, yet you really can't get lost. Its still a fun system to bike through. Expect to see hikers and dogs. Review: this trail is pretty easy in some parts and a little hard in some parts but overal it is pretty awsome. Review: I grew up riding these trails. While a majority of it is double track there are some great little off shoots that provide nice singles track and technical riding. When I visited in the fall of 2010 I was a bit disheartened to see how bad some of the had come to be. it is in need of moderate trail work in some spots but was still a great little park to rip aorund. Review: For a small area, it's packed with lots of trails. Mostly intermediate riding with obstacles for more advanced riding. Storms in the area will knock down brush and logs from time to time, most of it can be ridden over, especially if you're creative. 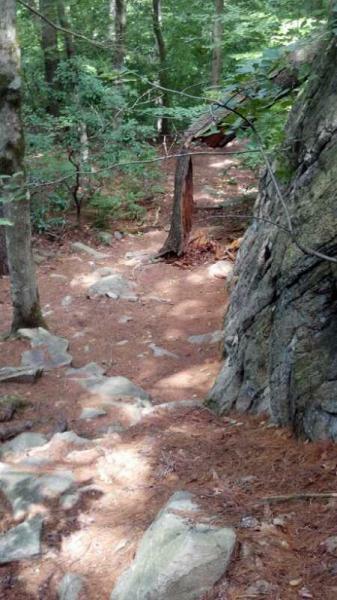 Recommended trails to hit would be Indian Rock(counter-clockwise), Cabin, and Deer trail. Mianus River Park MTB Trail 3.75 out of 5 based on 8 ratings. 8 user reviews.